Next decision was how to fit a Marathon and a decent bike ride in the next week. I'll be doing the San Francisco randonnurs 400k brevet workers ride in two weeks so I need to put some good miles on my legs, hopefully on the weekend before, that leaves no weekend day open for a marathon. I think it would be too much to do both a 26 mile run and a ~90 mile ride on consecutive days. I needed to run during the week. We were having contractors working on our kitchen one day so I decided that was the day I would take off from work. Normal start time, 8:55 am. I was not feeling that great but not bad either. I had not run since my last marathon back in February. 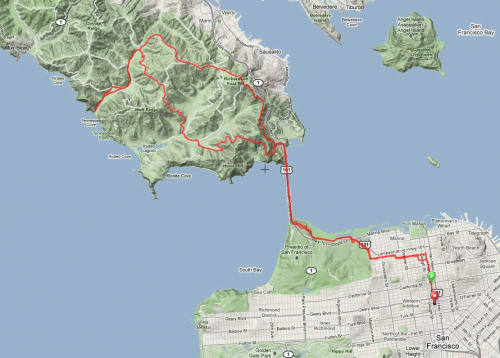 I had plans to ride to Crissy field, lock the bike and do a new route using at least 80% gravel trails but the logistics of parking the bike and my current fitness convinced me otherwise, I just started from our place as I had done on previous times. My route was similar to last time but this time instead of going to Rodeo Beach I would continue from Tennessee Valley parking lot to Tennessee Cove/Beach and back. Weekday traffic on city streets was definitely not as nice as on the weekend, however once on the Presidio things calmed down a bit and the Golden Gate Bridge span was not crowded with tourists. Weather was cool but no sign of rain, yet. That Coastal trail I had discovered last time was great again. I welcomed the opportunity to get off the pavement as soon as I could. I did not see a single trail user, hiker, biker or horse rider most of the way to Tennessee Valley. However, there were a couple of school field trips on Marincello and then many parties of older hikers were enjoying a walk to the beach from the parking lot at the stables. Quite a few construction/improvement was going on, volunteer crews where adding gravel to the lower part of the trail close to the beach, the recent storms had created many muddy sections in that little valley. I used to volunteering for this type of work in the GGNRA, it was very enjoyable I need to look again into that. When I arrived at the beach, about 13 miles into the run, I felt tired and took a few minutes and sat on a log while savoring a peanuts candy bar and digesting a couple of electrolyte pills. Time to get moving. Now the sky was darker and a few big drops were falling but not quite raining. That changed as soon as I started climbing out to the Tennessee Stables on Old Springs trail. A strong downpour got me wet but as soon as I thought it was time to put on my wind breaker the rain stopped. The trails were not too muddy considering how much it had been raining the weeks before, they were in decent shape for running but I would not recommend riding a bike there quite yet. I did another stop at the North end of the Golden Gate Bridge for cleaning stuff from the inside of my shoes and taking more electrolytes and then one more stop at the Strauss Statue on the South end. This one for a water refill. I was now officially tired but there were only ~5 miles to my finish line. These miles were painful, the arch of both my feet where complaining and as usual, I tried to talk them into cooperating as the rest of the body parts where doing. Finally when I got to the bottom of my last hill, Franklin at Union I felt better and in painful unison all body parts climbed. At exactly 1:55pm I was done. This route was harder than previous ones. I am looking forward to yet the other route I wanted to do but for that I would need very good weather conditions and to do a few shorter ~5-17 mile runs before. April will be another month where I will have a very low margin of error on the schedule with the 400k, the Fleche and a few mixed terrain rides planned. Oh yes I did this run on the same trail runners as last time, I glued the sole where it has separated and it worked all the way 'till the last 4 miles where I started literally dragging my feet. I really need to get a new pair of trail runners for my next marathon in April.